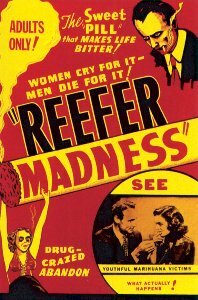 in the '50s and '60s as a cautionary tale about the horrible effects of smoking "marihuana". Oh...I can remember my father calling it "maryjane" on a few occasions....I also remember him saying a "shoe box full" was five bucks.And..you hippies drove up the price. What I find funny is that the ONLY people that ever called it "Mary Jane" were those in movies, TV shows like Dragnet, and those writing pamphlets.